Given the signiicant volatility in fuel prices in recent weeks, we’ve been fielding numerous inquiries from companies who are interested in developing a fuel hedging program for the first time in their company’s history. If you lack the knowledge to consider yourself a fuel hedging expert, this post along with several more that we'll be publishing shortly, will help you better obtain a better understanding of most common fuel hedging strategies available to commercial and industrial fuel consumers. For starters, what is a futures contract? A futures contract is simply a standardized contract, between two parties to buy or sell a specific quantity and quality of a commodity for a price agreed upon at the time the transaction takes place, with delivery and payment occurring at a specified future date. The contracts are negotiated on a futures exchange, such as CME/NYMEX or ICE, which acts as a neutral intermediary between the buyer and seller. The party agreeing to buy the futures contract, the "buyer", is said to be "long" the futures while the party agreeing to sell the futures contract, the "seller" of the contract, is said to be "short" the futures. In essence, a futures contract obligates the buyer of the contract to buy the underlying commodity at the price at which he bought the futures contract. Similarly, a futures contract also obligates the seller of the contract to sell the underlying commodity at the price at which he sold the futures contract. That being said, in practice, very few futures contracts actually result in delivery, as most are utilized for hedging and are bought back or sold back prior to expiration. There are three primary futures contracts which are commonly used for fuel hedging: ULSD (ultra-low sulfur diesel) and RBOB gasoline, which are traded on CME/NYMEX and gasoil, which is traded on ICE. Regardless of whether you're looking at hedging bunker fuel, diesel fuel, gasoline, jet fuel or any other refined product, these three contracts serve as the primary benchmarks across the globe. In addition, there are many other contracts (futures, swaps and options) available for fuel hedging, most of which are tied to one of the major, global trading hubs of Singapore, US Gulf Coast (Houston/New Orleans) and NW Europe/ARA (Amsterdam, Rotterdam and Antwerp). As an aside, the CME/NYMEX futures contract was previously known as heating oil and as such still trades under the symbol HO. For more information on the transition from heating oil to ULSD see NYMEX Heating Oil Completes Transition to Ultra Low Sulfur Diesel. So how can you utilize futures contracts to hedge your exposure to rising fuel prices? Let's assume that your company owns or leases a large fleet of vehicles and, to ensure that your fuel costs do not exceed your budgeted fuel price, you have been asked to "fix" or "lock in" the price of your anticipated fuel consumption. For sake of simplicity, let's assume that you are looking to hedge (by "fixing" or "locking" in the price) 42,000 gallons of ULSD (diesel fuel) which you anticipate consuming in January 2017. To accomplish this, you could purchase one February ULSD futures contract, which happens to trade in 42,000 gallon (42,000 gallons = 1,000 barrels) increments. If you had purchased this contract based on the closing price yesterday, you could have hedged your January diesel fuel for $1.6541/gallon (which excludes taxes and basis differentials as well as distribution and transportation fees). Now let’s fast forward to January 31, the expiration date of the February ULSD futures contract. 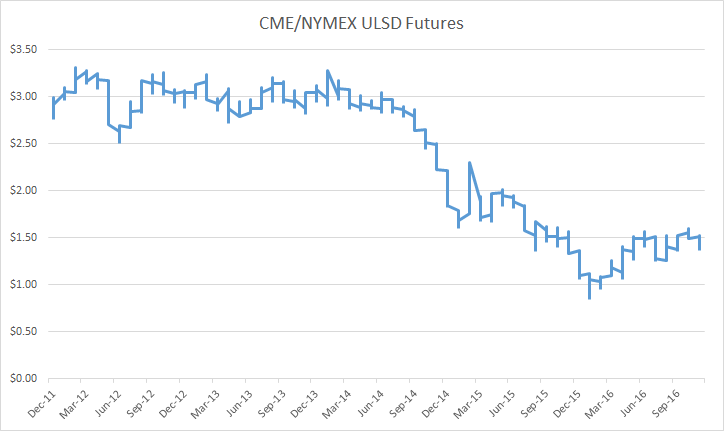 Because you do not want to take delivery of 42,000 gallons of ULSD in New York Harbor, the delivery point of the CME/NYMEX ULSD futures contract, you decide to close out your position by "selling back" one February ULSD futures contract at the then, prevailing market price. In scenario one, let's assume that the prevailing market price, at which you sold back the futures, was $1.75/gallon. In this scenario, your gain on the futures contract would equate to a profit of $0.0959/gallon ($1.75-$1.6541=$0.0959). As such, in this scenario your net cost will be $0.0959 less than the price you pay “at the pump” due to your hedging gain. In scenario two, let's assume that the prevailing market price, at which you sold back the futures, was $1.50/gallon. In this scenario, your loss on the futures contract would equate to $0.1541/gallon ($1.50-$1.6541=$0.1541). Contrary to the first scenario, in this scenario your net cost will be $0.1541 more than the price you pay “at the pump” due to your hedging loss. As this example indicates, purchasing a ULSD futures contract provides you with the ability to hedge of fix your anticipated diesel fuel costs for a specific month(s), regardless of whether the price of ULSD futures increase or decreases between the date that you purchased the futures contract and the date the futures contract expires. While this example focused on hedging diesel fuel with ULSD futures, the same methodology applies to hedging gasoil, gasoline, heating oil, jet fuel, etc. While there are many details that need to be considered before hedging with futures, the basic methodology of hedging fuel price risk with futures is pretty simple. That is, if you need to hedge your exposure to potentially rising fuel prices you can do so by purchasing a futures contract. Similarly, if you need to hedge your exposure to declining fuel prices, you can do so by selling a futures contract. Caveat emptor: Most companies will find that hedging their fuel price exposure is less than ideal as futures contracts expire on a specific day of the month and most businesses consume fuel every day. As such, many companies find that swaps (or futures which act as “look-a-likes” to swaps) serve as a better tool as most fuel swaps generally settle against the monthly average price (more on this in an upcoming post). Editor’s Note: The post was originally published in August 2012 and has recently been updated to reflect current market conditions.